Our newest Paulist priest celebrated his First Mass yesterday at St. Paul the Apostle Church. It's always a joy to be back in our community's "Mother Church," to return to the altar where I celebrated and concelebrated so many Masses during my 10 years as associate pastor, but especially to be back for such a joyful occasion as we celebrated there yesterday. One of the reasons a wedding is such a special and festive event is that it expresses and celebrates the hope that the human race will continue and that the story of this or that particular family is far from over but will, it is hoped, continue as well. I suppose that the First Mass of a newly ordained priest is a bit like that. It celebrates our continued confidence in Christ's promise to be with his Church until the end of the age, and our more particular hope that the Church will continue to flourish here in our own time and place and, even more particularly, our hope that our community story - in this case, the story of the Paulist Fathers, their life together, and their mission to North America - will likewise continue. Reflecting on the Church and the priesthood while in Egypt in 1873, Servant of God Isaac Hecker wrote: "The great work of the Holy Spirit is the the salvation, the sanctification of mankind upon earth and their glorification hereafter by means of the Church. ... It is the Holy spirit who, through the sacrament of ordination, is in the priest who consecrates the Body and Blood of Christ, who pardons sins, who blesses, teaches the word of God, and dispenses grace." As we watch Fr. Dat begin his sacred ministry, may we all recommit ourselves, according to our proper calling and vocation, to the continuation of this great story! This morning I attended the ordination of fellow Paulist Dat Tran to the holy priesthood. It was an occasion of personal joy for me, having known Dat ever he applied to enter the community while a senior at the University of California at Berkeley. I was privileged to be one of his interviewers when he applied and again a few years later served as his summer superviser while he was with us at St. Paul the Apostle parish in New York. More than any of that, however, his ordination is an occasion of great joy for our Paulist community, which has not celebrated an ordination to the priesthood in three long years. Hopefully, that desert experience is over as we look forward, God willing, to three ordinations next year. This morning's ordination came as the climax of a powerful experience of Paulist community, the 2011 Paulist Retreat at Long Branch, NJ, a Spirit-filled week which will joyfully conclude with Fr. Tran's 1st Mass tomorrow morning. Being together for several days of reflection, retreat, and prayer, hearing each others' stories of adversity and resilience, confirmed us Paulists as a community of joy, gratitude, and hope. The beautiful and relaxing oceanside setting certainly helped, just as the majestic magnificence of St. Paul the Apostle Church contributed to the grandeur of today's ceremony. When the Church calls a man and ordains him to the priesthood, it does more than set apart one individual, blessing and consecrating him for a holy life in the sacred ministry. In a sense, it recapitulates the character and call of the Church, animated by the presence of the Risen Christ, to be the priestly link, a conduit of grace, between God and the world, the institution within which and through which God's ancient promise to Abraham that, through him all the nations of the earth would find blessing, is literally being fulfilled. None of this changes the challenges that threaten the Church, religious life, and indeed the world - challenges of which the recent paucity of ordinations is certainly a serious symptom. A week like this is, however, a happy reminder of what we are all about and of who remains present among us. One of the largest collections of vernacular monophonic music from the Middle Ages, Cantigas de Santa Maria, associated with Alfonso X (1221-1284), King of Castile, Leon, and Galicia, supposedly reflects a medieval custom of honoring Mary on particular days in May. Formal “May devotions,” often accompanied by pilgrimages, have been attested to in 16th-century Italy, and from there they spread to other parts of Europe and eventually to America. Often the final devotion on May 31 was accompanied by a solemn procession. The popular custom of a “May Crowning” of statue of the Blessed Virgin Mary towards the end of May is, I suppose, a further development of this. Luke’s Gospel identifies Jesus, even before his birth, with the messianic significance of David’s kingship over Israel (Luke 1:32-33). Christian tradition and liturgy have long honored Jesus as King - and by extension Mary as queen - with all the symbolic splendor and resonance that those royal titles convey. In his 1954 encyclical letter Ad Coeli Reginam, Pope Pius XII, established a feast of the Queenship of the Blessed Virgin Mary, convinced, he claimed, “that great good will accrue to the Church if this solidly established truth shines forth more clearly to all, like a luminous lamp raised aloft.” The date Pius picked for his new feast was May 31, which certainly seemed to put a papal stamp-of-approval on the popular custom of May Crownings. In the current calendar, Pius XII’s feast (downgraded to a “memorial”) has been moved to August 22, the octave Day of the Assumption, thus fittingly connecting the concept of Mary’s queenship with her present post-Assumption position in heaven – and in the Church. However “May Crowning” may have originally developed, it remains a very popular Catholic custom. By its nature, a coronation highlights the special significance of the person being crowned. At the same time, the traditional use of a floral crown in the customary “May Crowning” gives it a somewhat folksy character, which perhaps has even further endeared it to people and added to its persistent popularity from generation to generation. “Master,” the Apostle Philip said to Jesus in the Gospel we just heard [John 14:1-12], “show us the Father, and that will be enough for us.” Now, most of us were brought up to be respectful to our teachers. So we instinctively peg Philip as a bit bold. Jesus’ response would seem to confirm our instinctive sense that what Philip was asking was really rather over-the-top. “Have I been with you for so long,” Jesus said to Philip, “and you still do not know me?” Ouch! On the other hand, if we’re really honest, isn’t that what we all want? Don’t we all want a direct line to God? Or at least some tangible sign of his reality and activity – some tangible signs that God cares about us and acts in our best interest? God had in fact answered my prayer precisely by getting me to understand that he was already present and active in my life. Responding to Philip, Jesus said something similar. “Whoever has seen me has seen the Father.” Jesus is our direct line to God, and we experience God’s presence and activity in our lives most effectively in our experience of Jesus. Now the normal way we meet Jesus – and also the normal way we share him with others – is in the Church, where we do so not as isolated individuals, but as “a chosen race, a royal priesthood, a holy nation, a people of his own,” as St. Peter proclaimed in today’s 2nd reading [1 Peter 2:4-9], quoting God’s words at Mount Sinai to the people of Israel [Exodus 19:5-6]. What God told Israel and (according to Peter) applies now to the Church is to be the liaison, the conduit, between God and the world, which we are because, like Philip, we too experience Jesus, the Risen Christ, living among us, always present in his Church. It was precisely the apostles’ confidence in the Risen Christ’s continued, living presence – as Lord – in his Church, that enabled them to take the bold step we just heard described in today’s 1st reading, from the Acts of the Apostles [Acts 6:1-7]. If nothing else that story reminds us once again of the perennial problem of factional conflict, of cultural and ethnic divisiveness, of ideological division and polarization, that can so easily undermine the unity and universality of the Church and get in the way of its mission – not just in 1st-century Jerusalem but in every time and place. Certainly, one of the unfortunate features of the decades after the Second Vatican Council was how its call for a greater engagement in the Church’s mission to the world so often became instead an occasion for conflict and division between different groups in the Church. But there was something else to that story. Confident in the Risen Christ’s continued, living presence – as Lord – in his Church, the apostles appreciated how the challenge they were faced with could become an opportunity instead of a threat. Thus, the apostles paved the way for their little sectarian community to expand linguistically and eventually to become the world-wide, multi-cultural Church it now is. Today we continue to be challenged to be that same liaison, that same conduit, Christ intended his Church to be between him and all types of people – to be as alert as were the apostles to the challenges and equally as ready to respond to the opportunities this complicated and diverse world offers. Homily for the 5th Sunday of Easter, Immaculate Conception Church, Knoxville, TN, May 21-22, 2011. To repeat the same news over and over - to oneself or to others – can help it be accepted and become part of the things that matter most in one’s life. To hear the proclamation of the resurrection, over and over, during these Easter Sundays strengthens our faith by the witness of others’ faith - in particular the faith of the apostles. So one of the most noticeable features that distinguishes Easter from other seasons of our Catholic liturgical year is the daily reading from the New Testament book known as The Acts of the Apostles. Through our journey with the original apostles through the book of Acts, we identify ourselves with that first generation of Christians in their experience of the Risen Christ, becoming like them a community of disciples which witnesses to the presence and action of the Risen Lord in his Church a community expresses its new life in its liturgy. Now one response to Peter’s message might have been a certain feeling of guilt. In the process of conversion, guilt is often a first step. Guilt alone, however, can get stuck in a focus on oneself. We avoid getting stuck, absorbed in ourselves, when guilt goes forward to true conversion, which resolves guilt with forgiveness and the freedom which comes from forgiveness. The proclamation of the good news – whether in 1st-century Jerusalem or 21st century Tennessee - ought always to lead to that call to conversion. As Peter told the people, the promise is made to all those. Whomever the Lord our God will call. The apostles’ message of the call to conversion was, in the first instance of course, an invitation to identification with Christ in baptism. But, once we have been baptized, we are repeatedly exhorted, as Peter exhorted his hearers in today’s 2nd reading [1 Peter 2:20b-25], to follow in Christ’s footsteps, living the new life made accessible to us by Christ’s death and resurrection, remaining united with him no matter what. We hear this message repeated, Sunday after Sunday, during this Easter season, inviting us to see something not just for the 1st century, but for ourselves here and now already one decade into the 21st century. In particular, on this 48th Annual World Day of Prayer for Vocations, the Church challenges us to focus in a special way on what is required for the message to continue to get out, to continue to get transmitted, from this generation to the next, in the life of Christ’s Body, the Church. With confidence in the Risen Lord’s promise to be with his Church forever and never to abandon it, we must like those first Christians nevertheless take seriously our responsibility to do our part in making the mission of the Church actually happen among the people of our day. Homily for the 4th Sunday of Easter (48th Annual World Day of Prayer for Vocations), Immaculate Conception church, Knoxville, TN, May 15, 2011. Personally, I am not expecting the world to end on May 21. Of course, it could end that day. However, the Lord was quite clear in stating that the identity of the Last Day is a secret. So the fact that there is all this silliness going around about the end of the world on May 21 suggests to me that it will more likely happen on another day. On the other hand, whenever it does happen, so be it! The challenge is not to know when, but to live always so at to be ready for the end! Of course, this is the Eater season, which means I have been required to read regularly in the Liturgy of the Hours those horrifying predictions from the Book of Revelation, predictions which, throughout history, inevitably have encouraged such speculations! But, while the world itself may not be ending, terrible things do keep happening. This does highlight the larger question that inevitably arises when calamitous events (e.g., destructive storms and floods in the US and earthquakes around the world) occur. Again, throughout all of human history, people have readily ascribed natural calamities to divine wrath. Even humanly induced calamities, e.g., wars, have been so interpreted. The best example in American history, of course, is Abraham Lincoln's interpretation of the Civil War as God's judgment on Americans for the sin of slavery. Such views seem much less fashionable today - even among those who still purport to take scripture seriously. We all recognize that natural calamities keep happening, no matter what. We also recognize that there is obviously no clear connection between their victims and specific sins. I am reminded of Thomas Hobbes, who, when told that various calamities were being blamed on his purported "atheism," supposedly wondered why then he managed to escape unscathed when all sorts of other suffered. Only in the most general sense can one suggest that humanity's fallen condition is to blame for the world's ills. Even that claim would be challenged by some. In any case it is far too generic to explain - or, better, to interpret - the woes of the moment. And interpretation is precisely what is desired in such circumstances. Thanks to today's feast of the Apostle Matthias, at least I get to skip the regular weekday reading, which, after describing an earthquake killing 7000 persons, goes on to say: The second woe is past, but beware the third is coming very soon. I seldom get comments on my blog, but my posting on the Royal wedding generated several. (I guess that confirms that that was an event people actually cared about). That, of course, represents a libertarian line of argument – precisely the type of argument that I was completely rejecting in what I wrote (and which the Catholic and natural law moral traditions have always rejected). It seems to me that the libertarian starts with the supposedly free individual and sees social and political relationships as artificial and an infringement on the individual’s liberty. (Remember Margaret Thatcher’s allegedly saying that there is no such thing as “society”). In contrast, Catholic and natural law moral traditions assume that we are naturally social and political beings, and that such natural social and political relationships are essential for human fulfillment. While moral questions may appropriately arise about the proper use of political power, neither social relationships nor political power, per se, require further justification in the Catholic and natural law moral traditions. They are natural givens. That we have binding obligations to one another as part of a political community (without which we could neither survive nor thrive) is therefore also a given. Taxation is one form such obligation takes. (Hence, St. Paul’s famous injunction to pay taxes to those to whom taxes are due – Romans 13:7). Of course, there is plenty of room for debate and disagreement about the optimal level of taxation and similar such policy questions, about all of which reasonable people legitimately can and do disagree. Indeed it is in the nature of politics – as opposed to ideology – to recognize legitimate differences in interests and to seek to reconcile them through deliberation, debate, compromise, etc. But legitimate debate about the optimal degree of taxation to achieve the public good is quite different from the libertarian line – and its contemporary incarnations in Tea Partyism, etc. – that the State is some alien coercive force and that taxation is a somehow presumptively illegitimate infringement on an individual liberty that enjoys moral priority over any notion of public good. Needless to say, in our fallen, sinful condition, any exercise of power – in the family, in social institutions, in government – has the potential for serious abuse. Hence, we have constitutions, laws, regulations, and customs to regulate power and to hedge its use with reasonable restrictions. All modern democratic societies attempt to do this to a greater or lesser extent. Historically, the American political system has done this more or less well – with the conspicuous exception of corporate economic power, which it has not done such an effective job of regulating (one reason perhaps for the current recession), a problem which, paradoxically, libertarian ideologies, which oppose most restraints on corporate economic power, actually exacerbate (in the process limiting the effective freedom of most citizens without equal access to economic power). As Winston Churchill famously observed after the RAF's victory in the Battle of Britain, it wasn't the end, or even the beginning of the end, but was at least the end of the beginning. Yesterday's successful assault on Osama Ben Laden's hideout certainly does not mean the end of terrorism (or of our War on Terrorism). It will not usher in a new era of happy-ever-after. But it does terminate the career of one of the worst mass murderers of our time, which itself is certainly something to be thankful for, and it ends at least one chapter in the War on Terrorism, the chapter that began so tragically on a late summer day in September almost 10 years ago. Limited accomplishments are still accomplishments. Most victories are ultimately limited, but limited victories are still victories. And this was certainly a great victory for the US and for the entire civilized world. Once again, the American military showed what it can do, and their accomplishment deserves unqualified praise. The President and the military have reminded us of the serious matters which are what we have a government for - a timely reminder for our distracted society, so ill-served by the media-driven circus that has become our substitute for true politics and serious citizenship. The famous, so often quoted words from Pope John Paul II's first Papal Homily on October 22, 1978 - "Do not be afraid! Open wise the doors to Christ!" - were prominently displayed in the St. Peter's Square during today's beatification Mass. So, it was certainly no surprise when Pope Benedict himself cited them in his homily today. What John Paul asked of everyone, Pope Benedict recalled, "he was himself the first to do: society, culture, political and economic systems he opened up to Christ, turning back with the strength of a titan - a strength which came from God - a tide which appeared irreversible. By his witness of faith, love, and apostolic courage, accompanied by great human charisma, this exemplary son of Poland helped believers throughout the world not to be afraid to be called Christian, to belong to the Church, to speak of the Gospel. In a word: he helped us not to fear the truth, because truth is the guarantee of liberty. ...Throughout the long journey of preparation for the great Jubilee he directed Christianity once again to the future, the future of God, which transcends history while nonetheless directly affecting it. He rightly reclaimed for Christianity that impulse of hope which had in some sense faltered before Marxism and the ideology of progress. He restored to Christianity its true face as a religion of hope, to be lived in history in an 'Advent' spirit, in a personal and communitarian existence directed to Christ, the fullness of humanity and the fulfillment of all our longings for justice and peace." The Pope could hardly have put it better. In 1978, the Cold War as seen as a static state, a permanent division of the world, with the Communist Empire firmly established in Eastern Europe. It was the age of "Detente," a time when what passed for a progressive, forward-looking approach - both in international relations and within the Church - was to accept the permanence of Communist power and settle for making the best deal possible with it. Perhaps not unrelated to that, it was also a time when the fundamental beliefs and values of of Christianity and Western Civilization seemed to be under challenge - not just externally, which one would expect, but from within. Blessed John Paul had many concrete accomplishments as Pope. Prior to any particular accomplishment and underlying all of them was the way he radically changed the tone of the time. The Church emerged from a defensive posture that more and more seemed to resemble a complete retreat in the face of the modern world - the modernity aptly identified by Pope Benedict as "Marxism and the ideology of progress" - to be a public and forceful witness to liberating truth (and so a "witness to hope)." In a world in which lies like Marxism and the ideology of progress were permitted to be true, that was radical stuff - and it worked! 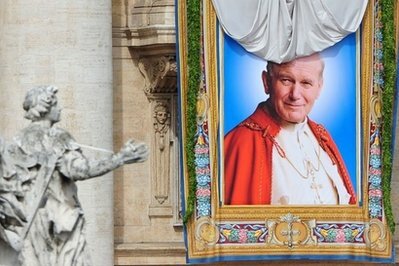 To quote one of John Paul II's best-known biographers: "In a season of Christian timidity, John Paul's unapologetic Christian witness explained no small part of his transformative impact on individuals from an extraordinarily wide variety of backgrounds" (George Weigel, The End and the Beginning, p. 476). All that was the fruit, of course, of a holy life, a sanctity rooted in the nurturing experiences of Catholic culture and family, challenged and strengthened through the tragic experiences of the 20th century, history's bloodiest century. Coming from a country, Poland, that had, as was so often said, lost World War II twice, John Paul proved to be the providential person to shake up the world's complacency and stop the downward spiral that was the 1970s. In his own life, which saw so much struggle and suffering, producing such a fruitful ministry for the both Church and the world it is called evangelize, he exhibited to a heroic degree what the Paulist Constitution calls "those unique qualities of freedom and joy which a reflective experience teaches ... wil best display Christ and his church." Understandably fearful for their safety, the disciples had hidden behind locked doors. Perhaps this was the same “upper room” where they had so recently eaten the Last Supper and where they would gather again after the ascension to await the coming of the Holy Spirit. If so, how appropriate! Since apostolic times (long before it ever became a day off from work), Sunday, the first day of the week, has been the special day, the irreplaceably privileged day, when Christians assemble in their churches to encounter Christ, the Risen Lord, present through the power of his Holy Spirit in the sacramental celebration of the Lord’s Supper, the Eucharist. On that first day of the week, Jesus came and stood in their midst and said, “Peace be with you.” Surely, that was no mere wish on his part! Christ, the Risen Lord brings peace –not some social or political peace, but the peace that conquers fear. It is clear enough from the locked doors just how fearful the disciples must have been. Many of us do in fact spend much of our lives behind locked doors – a sensible practice perhaps, but one obviously rooted in fear. There are also the many locked doors one doesn’t see, but feels nonetheless. We may not be so afraid of the authorities as the disciples were, but our fears are no less real, wounding us in all sorts of ways, wounds we carry within us, concealing them as best we can. For the resurrection was not just some nice thing that happened to Jesus - and then leaves everything else in the world completely unchanged. It was – and is – the foundation of what the first letter of Peter, from which we just heard [1 Peter 1:3-9], calls an imperishable, undefiled, and unfading future inheritance to which, through the resurrection of Jesus Christ from the dead, we already have access here and now in the present. Like Thomas, we were not there on that first day of the week, but we are here today - on this first day of this week. The celebration of Sunday is, as the Catechism says, “at the heart of the Church’s life,” “the foundation and confirmation of all Christian practice,” “a testimony of belonging and of being faithful to Christ and to his Church” – the Church, which professes its faith in the Risen Lord and his new creation, and “so bears, nourishes, and sustains” our faith. The 1st day of the week, the day on which God began the work of creation, has become our day of re-creation, the beginning not just of another week but of a whole new way of life, pointing us forward to the fullness of that new creation in which, living for ever with the Risen Christ, we will finally become most fully human. Homily for Divine Mercy Sunday, the 2nd Sunday of Easter, Immaculate Conception Church, Knoxville, TN, May 1, 2011.